Just a few blocks from my apartment, there is a small cafe that serves wine, beer, and an assortment of snacks. For years and years now, they have had a salad on their menu that I often find myself craving. 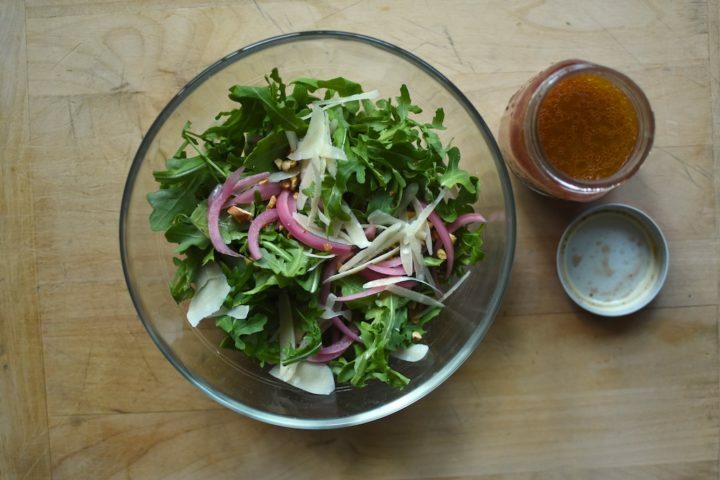 It’s a tangle of baby arugula, topped with pickled red onions, toasted almonds, creamy goat cheese, and roasted beets. Sometimes I walk myself over there and treat myself to this salad, but most often, I gather a few ingredients from my own kitchen and make versions for myself. Tonight, I had several of the necessary building blocks and got to work. 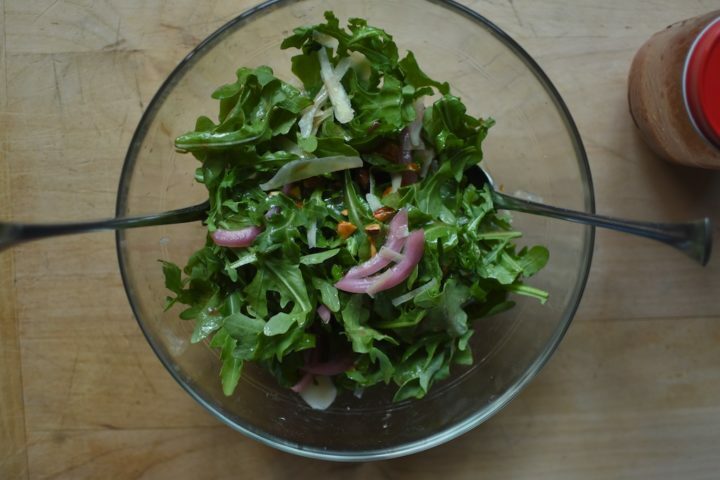 I piled baby arugula into a bowl and added the pickled red onions (a fridge staple around these parts) and toasted almonds. There was no goat cheese, so I swapped in some shaved parmesan instead. There was nothing akin to the roasted beets, so I skipped them entirely. I dressed my salad with a vinaigrette I shook up in a jar of strawberry jam that had a scant half inch left in the bottom (a more organized Jammy Vinaigrette technique can be found in The Food in Jars Kitchen) and called it good. It was a most delicious salad, made extra satisfying because it made good use of two open preserves in the fridge. A perfect entry for this month’s Mastery Challenge, if I do say so myself! That salad sounds lovely. It puts me in mind of one of my favorite picnic items: a baguette-based sandwich with goat cheese, olive tapanade, caramelized onion jam (cooked down with a handful of zante currants), roasted red peppers, and arugula. I might just have to whomp one up this weekend. Thanks for the inspiration! Do you have a recipe link for pickled red onions?